Gua Kajang is one of several caves in Bukit Kepala Gajah limestone massif. 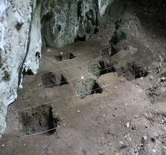 It was the site of the first cave archaeological excavation in Malaysia, carried out in 1917. The cave is situated at latitude 50 07.57’ North and longitude 1000 58.87’ East at an elevation of 76 metres above sea level. During the 1917 excavation, fragments of pottery, stone tools, food residues and human skeletal remains were uncovered. It appears that Gua Kajang was continuously occupied between 11,000 - 5,000 BC during both the Palaeolithic and Neolithic periods. The accompanying pottery can lay claim to being firstly the oldest recorded pottery in the country, and secondly to be evidence for the continuation of Palaeolithic culture into the early Holocene period, a period before the beginning of the Neolithic that is marked by production and usage of pottery. Gua Kajang is an interesting cave with a unique tunnel-like structure together with fascinating stalagmites and stalactites. 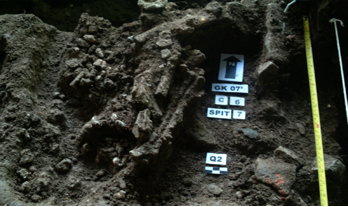 A Palaeolithic burial contained a female skeleton (GK1) dated to around 10,820 +/- 60 BC. She was buried with bifacial (two-sided) and unifacial (one-sided) stone tools and food as grave goods. 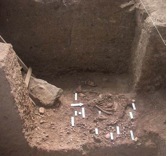 Approximately a meter away to the southeast of GK1 was discovered another skeleton in what resembled a Neolithic burial (GK2; 7,890 +/- 80 BC) with food remains, stone tools and pottery. This skeleton was buried at the depth of 20 cm and in an extended pose. Gua Ngaum is located 89 metres above sea level on the Bukit Kepala Gajah limestone massif at latitude 50 07.46’ North and longitude 1000 58.72’ East. This site was first discovered in 1990 by a team from University Science Malaysia. It was named ‘ngaum’ after a tiger was heard roaring outside the mouth of the cave soon after it was discovered. Food remains, stone tools and potsherd (fragments of broken pottery) are evidence of human habitation around 7,000- 6,000 years ago. 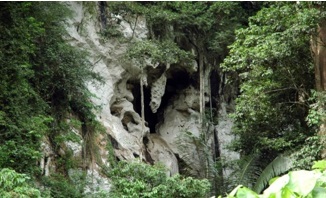 Gua Puteri is a cave within the Bukit Kepala Gajah limestone massif. It is located at latitude 50 07.56’ North and longitude 1000 58.80’ East and at an elevation of 94 metres above sea level. 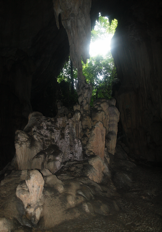 Curiously, the limestone formations inside the cave can be taken for sculptures depicting a map of Malaysia, a frog, a couple on a wedding dais, an elephant’s head, a mosquito net and others. Local legend has it that these were once living beings but were calcified by an evil spirit called Sang Kelembai. Legends aside, geologically speaking, these are simply stalagmites and stalactites in their amazing varieties, which grew with time into the space available. 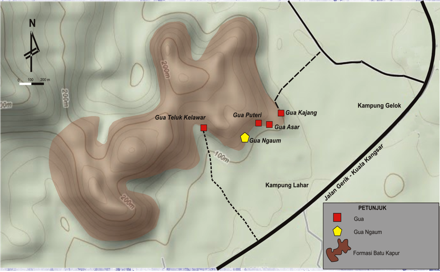 Gua Asar is located within the Bukit Kepala Gajah limestone massif, at latitude 50 07.53’ North and longitude 1000 58.82’ East. It sits 78 metres above sea level and neighbours Gua Kajang. 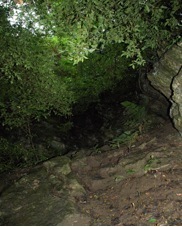 The cave bears an interesting limestone formation and has yet to be investigated in detail.